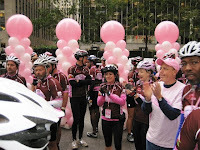 The last day of the Tour de Pink was pretty simple. Assemble in the lobby into our designated groups. I was a group leader as well as Cinco. We needed to leave in 30 second intervals as to not congest the NYC streets...aka Critical Mass. A hefty fine would be impacted upon us if we violated this rule. Anxious to get rolling, the departing groups form. On the sidewalk on 54th Street. 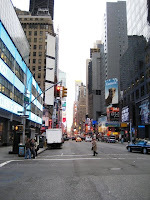 Monday morning and not a very busy street for NYC. Sitting at the traffic light waiting for the green. The lanyard around my neck was hooked to the digital camera. This long tether allowed me to keep the camera in my jersey pocket while riding and not drop it should things get dicey on the bike. On the sidewalk to the Fox & Friends show, we enjoyed bagels, coffee and bottles of orange juice. NYC is cold this time of the year in the morning, concrete and steel do not lend themselves to holding in any levels of warmth. 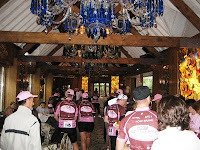 The cyclists rolled in group by group and then the interviews began between the survivors and the TV show host. 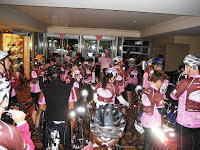 Our TV apperance did a great job of showcasing the YSC's mission statement, the cause that the cyclists supported over 220 miles, and just how important the topic of breast cancer in women under 40 really is. We left Fox and traveled the streets of New York to the Tavern on the Green for a celebratory brunch. In my usual road ride leading fashion I missed a turn on the way there. My group ended up doing a 'victory lap' through Central Park. We hit the cut off-road in the park and rolled in safely to the Tavern. The reality of this great event ending was evident as we enjoyed brunch. Hugs were exchanged, phone numbers and email address swapped. I swiped this photo from Kim, hope you don't mind! (l-r) Me, Kim and Eldon. Kim has two nice bikes. A Seven Cycles and a Pinarello Prince...and I thought I was a bike geek...? A handful of beautiful survivors made their faces and names known on national television that morning. Breast cancer isn't exclusive to just women over 40, it's INCLUSIVE to women in general. Screenings are important, regular self exams must not go unperformed. Should a situation arrise for any female, the YSC is there to offer support and guidence on every level to patients, family members, friends and loved ones. 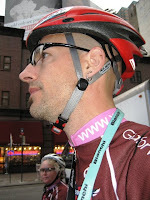 A big thanks to G4, all the volunteers, those that supported me through donations and prayers for the long journey. 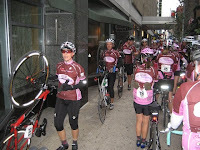 Tour de Pink '08 pix.